Here are a few pictures from the first day of O’Reilly Solid Con at Fort Mason San Francisco. This YouTube video caught a rarely spotted Tango T600 electric car as seen in HBO’s new comedy ‘Silicon Valley’. This tiny speedster can do 0-60 in 3.2 seconds all under electric power. The very narrow design can split lanes and fit in narrower spaces than some motorcycles. The T600 is probably the world’s slimmest car. Seats are set up like an F-14 fighter jet in a tandem arrangement. Though you probably shouldn’t drive the T600 inverted like Maverick and Goose. This is the same orange car that is featured on the commutercars.com website and the Progressive Automotive X-PRIZE. This bright orange specimen is actually owned by someone who has done quite well here in the Valley. This very car has been driven by well known car nut Jay Leno. George Clooney also has a classy glossy black version of this rare electric automobile. He bought the very first T600 from the Spokane, Washington company. If you like to go fast but want to use petrol instead of electrons, you can pick up a base Audi R8 for close to the same price as a Tango T600. Though going fast isn’t the main design point of this car. The Tango T600 is similar in size to the Corbin Motors Sparrow (now known as the NmG for No more Gas), but way cooler. This is one tiny Tesla competitor. Hopefully it won’t get tipped over after being left alone in the car park. But it could wind up in an office on April Fool’s Day. Google’s Eric Schmidt found one of these in his office in 2008. A video is still up on YouTube of the tiny car antics. One surprising thing you may notice in the clip is how small Eric Schmidt’s office actually is for such a high position in a high powered Silicon Valley company but that’s the way they roll at Google. As you’ll see in the video, this isn’t the first time a car has found its way inside Eric Schmidt office. The Tango T600 weighs about as much as a Subaru Outback due to the batteries, so the Google engineers didn’t carry the mini car into the building. The California license plate of this office dwelling blue car is 6DET206. Other known Cali license plate numbers for these so far extremely rare mini automobiles are for the orange one in the photo above, 6JEY683. Another based in Washington state has plate number 836-JYC. Most of these cars reside on the West/Left coast. You probably won’t find one of these Tangos speeding up the mountains of Wyoming, but you never know. You can download the brochure for the Tango electric car but you probably will have a hard time finding one for sale. The first episode of HBO’s Silicon Valley is available in full on YouTube. 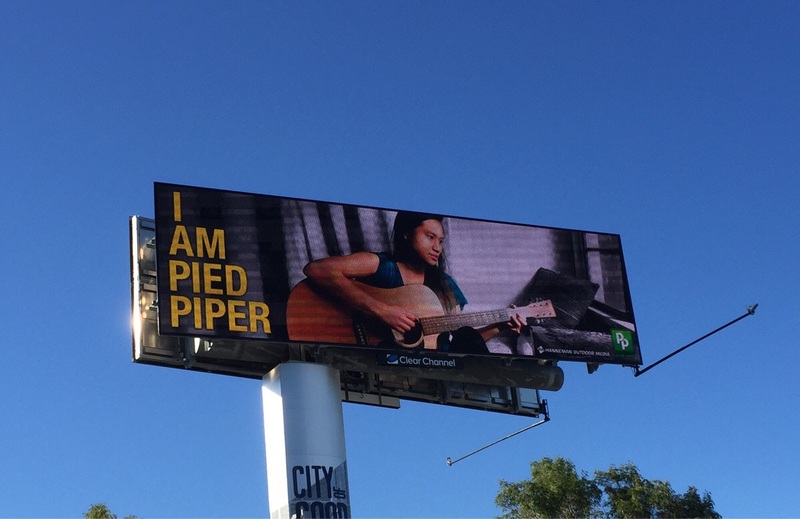 The fake company website for Pied Piper is also of course live at PiedPiper.com. Oh, and by the way, I am not Satoshi Nakamoto. Dōmo arigatō, Mr. Roboto. 6DET2066JEY683836-JYCCorbin Motors SparrowI am not Satoshi NakamotoJay Leno TangoNarrow Car in HBO Silicon ValleyNarrow Track VehiclesNmG electric carPied Piper fake company websiteProgressive Automotive X-PRIZEtango car in Google's Eric Schmidt's officeTango T600 Electric Sports CarUltra-Narrow Electric CarYou were in a 4g inverted dive with a MiG28? The growing flock of Twitterers celebrated 2013 in style with their first holiday party since the successful IPO earlier this year. City Hall in San Francisco was bathed in Twitter Blue lighting inside and out. Some of the unusual treats featured were blue cotton candy served on blue glow-sticks. Sadly, as of November 14th 2012, Airship Ventures ceased operations. No more will their giant airship Eureka be seen floating over SiliconCali and the Bay Area. Due to the nature of Zeppelin travel, a slow moving airship with a large cross section that gets pushed around by the wind, weather conditions can cancel a planned trip at any time. This probably didn’t help the profitability of the company as people that book flights don’t realize the fickle nature of lighter than air vessels. And they never managed to secure a full time financial sponsor. MOFFETT FIELD, Calif., November 14, 2012 – Airship Ventures, operators of the world’s largest passenger airship, the Zeppelin Eureka, have announced today that despite history-making successes and a stellar performance and safety record, they will be ceasing operations immediately. Blending the romance of the “golden age of aviation” with the latest in high-technology, Airship Ventures, founded in 2007, brought a Zeppelin NT (“New Technology”) airship to the USA for flightseeing, science missions, media and advertising operations. Passenger flights began in 2008 in the Bay Area (Silicon Valley, Oakland and San Francisco) and Long Beach, and most recently expanded to California’s beautiful wine country. 2012 saw the addition of behind-the-scenes educational ground tours of the airship. In addition to passenger flights and advertising, the Eureka had performed a wide variety of special missions for government, science and research groups, including recent expansion into airship design, research and development. Since its founding, the company had faced challenges including the economic recession that impacted regular passenger numbers and demanded the need for a regular sponsorship partner for the company to remain viable. Adding to this, a world helium shortage increased the company’s operating costs and pressure for a long-term sponsor that had not materialized. • Created the first large scale passenger airship operation in the US since the 1930s. • Welcomed the 20,000th passenger during a flightseeing tour over San Francisco in 2012. • Celebrated four years of passenger operations in 2012. • Completed a history-making, six-month coast to coast cross country tour in 2011. • Covered 459.3 miles and broke the standing Federation Aeronautique Internationale (FAI) airship distance record in 2010. • Partnered with NASA and SETI on meteorite seeking missions over Sacramento and Sonoma, California, and with SETI on the study of extremophiles in the bay area salt ponds. • Acted as a training vessel for the U.S. Air Force’s test pilots. • Certified and demonstrated the use of Raymarine Radar and FLIR Systems infrared systems for use in the roles of Maritime Patrol and Search and Rescue with the airship. • Launched a social media campaign displaying the world’s largest Twitter hashtag as a decal on the airship. Their website, airshipventures.com, is still active. Though the scenario was likely faked for entertainment value, Top Gear’s infamous flying caravan zeppelin troubles demonstrate the problems with trying to fly in a particular direction in a lighter than air craft. And it was built from a hot air balloon, so technically it wasn’t a zeppelin. A fire at around 1 am on the morning of August 11, 2012 caused Comcast Internet and Cable TV to go out in parts of the Santa Clara area. As of 1 pm, repairs to the damaged cables appear to be complete and Comcast Internet and Television service seem to be back up. The outage also seemed reduce area cell network coverage on the Verizon network, dropping out local 4G coverage. Several users also reported weak standard cell phone signal strength and dropped, choppy phone calls during the outage. If you still have problems reset your modem and call Comcast at 1-877-Comcast if you need more support. Aside from outages like this caused by destructive events, the Silicon Valley area seems to experience multiple outages for no apparent reason. Why does the most high tech area in the world have some of the worst internet service? How reliable is you internet service? Is it more reliable than a 3rd world Internet Cafe?